Okay, okay. Y'all are sick to death of me. But this is a riot. Well, this first part isn't that funny. Just delicious. 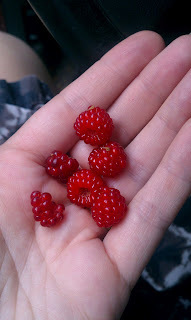 Our raspberry bushes are finally fruiting! YAY! Now, on to the funny. We went bowling today, and you must see Lulu's divine technique. For a kid with dry spaghetti for arms, she makes it work. At the end I show the scoreboard. She's Lulu, Helper Monkey is "Monky" because they only let you have five characters in your name, and I'm "Miten". Lulu spent the entire game calling me Might-en, and her father Mawn-key. Gotta love it. The scoring table we were at was directly under the A/C vent, so it was the perfect way to prevent melting today. I hope everyone else out there is having a cool evening (in every sense of the word).